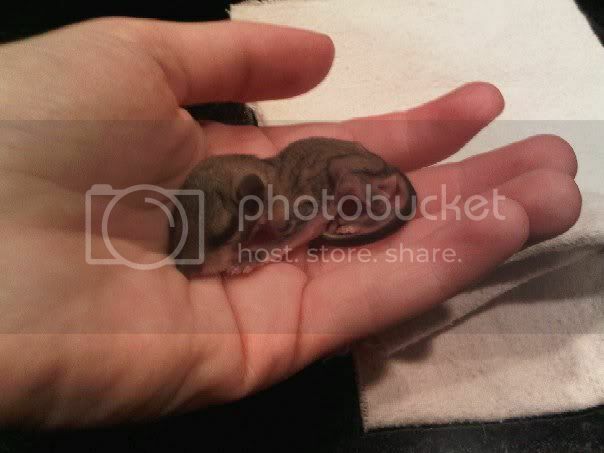 I've had a new baby flying squirrel brought in to work, about an 1 to 1.5 inches long, has a light coat of fur on it. Been feeding it every two hours so far, its went to the bathroom twice so far. I was curious on just how much i should be feeding it of the esbilac formula, like around one tenth of a cc to what, I've been feeding it around .1 to .3 so far, but did not want to over feed the little one, i have him on a heating pad at the moment set on low, he is very active and moving around, the eyes are still closed, and he is underweight. I don't have anything to weigh him with at the moment unfortunately but will have a chance to when im back at work tomorrow. Pippin seems interested but at the same time she is ignoring him entirely and going about her normal business so far lol.